Antiques experts Phil Serrell and Kate Bliss venture to the other side of the rostrum at an auction in Gloucestershire, each hoping to make money for their chosen charity. Browse content similar to Phil Serrell v Kate Bliss - Auction. Check below for episodes and series from the same categories and more! This is Put Your Money Where Your Mouth Is. ..and gives you the insider's view of the trade. ..putting their reputations on the line. against the villain of all things vintage, Phil "The Fox" Serrell. Coming up, Phil does some underhand bidding to get ahead. Kate tries to keep things under wraps in the auction room. -This is great, this thing. And Phil feels sick after a trip to the doctor's. I'm going to need some medical help after this, you know? Yes, you might well do. The scene is set. Our two luvvies of the lots are waiting in the wings. in Put Your Money Where Your Mouth Is: The Auction. -I can't see a thing. -Try it on for size. -..and does all her own stunts. the dark lord of the deal. Live long and prosper. Mr Spock, he's the boy. as only one virtuoso can be victorious. He's really pretending to be relaxed, but he's not. All the profit they make will be going to charities of their choice. it's time to put your money where your mouth is! -How are you? All right? Good to see you. -How much have we got in our pockets? -and a lot of lots in there, aren't there? -which might be right up your street. or something like that, perhaps sell it to someone who's got an interest. -I mean, you've got to look, haven't you? you know quite a few people with an interest in cars. Well, we try. We try. -And had a little shifty. But, I have to tell you, I don't think I'm any further forward. to find their profit-busters as this sale has over 700 lots. and are writing their own winning storylines. with perhaps some items that aren't top quality. It may be that I don't go for something in perfect condition. Just go for something really interesting. Phil is a man with a foxy plan. you've got to react to what you see in front of you. so, if there is a plan, that's it. So, Phil's plan is to have a plan. so being open-minded and creative can make all the difference. and one lot I found is a ring and a pair of earrings set with amber. Now, the amber is in lovely condition. and it's rose gold which has a lovely pinky colour to it. with my commercial head on, there's plenty of people who do. as he spots a signed movie poster with an upper estimate of £250. Every boy thinks he's Bond. Now, this is from one of the first Bond films - From Russia With Love. to someone, if I buy it, who's got that real urge to be Bond. of '90s glasses with an estimate of £40-60. You almost had a smash hit there, Kate! so, without further ado, it's show time. Please switch off your mobiles and take your seats. This is going to be a tense tussle for treasures. The competition may be tough, but Kate is ready for the opening act. Now here's that little amber lot. Ah, jewellery! You can see her eyes light up. Let's hope the amber turns to green. 55 at the back. 60. And 5. 70. The bid's in the room and I'm selling to the room at 75. -That's with me. First lot! Kate held her nerve and bagged a bargain. The jewellery is hers for £88.50 including fees. so I got it almost at the bottom estimate which isn't bad. At £75. I'm selling to the internet now at 75. ..quietly cleaning up all the goodies. Selling to the internet at 80. I'm selling to the internet at 35. This is all online, so the bidding is going up and up and up. Nobody is bidding in the room. The power of the internet at the auction these days. it's with that computer up there. 140. 150's with me. Is there 160? For me, this is just too much money for this. I'm selling to the net at 180. I think I've got to be braver. with an estimate of £30-50. And the bid's in with me at £12. Is there 14? At £12. The bid's 14. 16's with me. 18. 20's with me. 22. 25's with me. 28. I'm out at 28 in the room. Hello! Phil's muscling in on Kate's act. Is Philip bidding against me on this? At £42. I'm selling to the room at 42. -That was really mean, just as Kate was bidding. That was really mean and rotten. Did you want those weights? I just thought they were really expensive. Don't be fooled by their bonhomie. and floats further into the lead with two items to Phil's no items. and I think this is a really nice example. is the way they all fit really neatly inside each other. but the best thing is that this comes with them. A bid in at £25. Is there 8? At £25. The bid's with me. 28 takes me in the room. Is there 30? At £28. Off the book and in the room. 30 at the front. 32. The bidding's in the room here which is interesting. Not online. At £40 seated now. Is there 2? That's with me at the moment. And this model of a Hereford bull is by Beswick and really collectable. Now, the estimate in the catalogue was £60-£80. so I still think it's got great potential. He seems to be having a day off. and he will have his strategy up here. You seem to be very relaxed. When you've bought nothing, it's pretty easy really. waiting for the right lot to pounce on. and it's time for Serrell to take centre stage. And I'm bid in at £30. Is there 2? At £30. At £80. The bid's in the room now. £85 at the back. Is there 90, sir? At £85 standing now. I don't quite know what I've done here, you know? Selling to the room at 85. -Will you promise not to laugh? -What is it? What is it that you want? 125. I think it's an enema kit. Just up his street, then! because there's some really interesting lots amongst it. I think they're really cool, funky things. Hopefully, I might have someone in mind for it all. And, with one buy down, Phil's in the mood for more. so it'll be interesting to see if I get my hand in the air. But it's Kate's hand that's in the air next. and that's five lots to Phil's one. of England and Wales and this is a page from that atlas. which show the route along the way. Having bought it, I'm going to look at it even more closely. and this isn't stuck down. Very importantly, you can lift it up. that would devalue the map quite significantly. and I just love this. All it is is some used railway tickets. How smart is that? But have a look at these here, look. I love this one here. so, clearly, some soldier who came home. They're lovely looking. There's history there. There's someone's life story of travel there. Who am I going to sell it to? Well, all I've got to do is go and find myself a train buff. his for £177 including costs. hat-trick hero of the 1966 World Cup. there's probably another 90,000 or so of these. he spotted earlier with an estimate of £150-250. At £100, bid to me, 110. 120 is with me. 130, sir. 140 is with me, 150. I'm out at 150 in the room now, is there 160? At £150, the bid's in the room and I'm selling to the room, 150. I think I need to go and sit down. I'm getting quite dizzy here. Her Majesty's Secret Service, Phil. The poster is £177 including costs and brings Phil's purchases to four. Philip looks like he has finally woken up. It's all good fun this, isn't it? You've got to keep up. You've got to keep up. find out who's in the blockbuster and who's facing a flop. Both our dealers started the day with £1,000 of their own money. leaving her with just over £688 for the rest of the day. leaving him with over £512 in his kitty. including Georgian bookends for £59 with costs. Generically, this will fall into the category that we call treen. Actually, treen is a turned and small wooden object. These are somewhere between 1880 and about 1920. ..I think, a really cool pair of bookends. I think that's quite an interesting little lot. I just hope someone else does. Our battling behemoths have drawn level with five lots each. This is turning into a close one. Can Kate pull out in front? Now, the next lot is a really interesting 19th-century corkscrew. goes for and if it is not too much, I might have a go. At £25, looking for eight. 28 bid, thank you. Look at that focus and determination. Go on, Kate. £52 then, are we done, at £52? HE BANGS GAVEL Thank you. paying £61.36 with costs for the antique corkscrew. Now, corkscrews are collectable for a number of reasons. the rarity of the mechanism or the name associated with them. Thomason is a good one to look out for. But my purchase is without any name. It has a nice winding mechanism. and that was used to dust off your bottle from the cellars. It is in super condition. We've got an extending ladder. I'd put my money on a good profit. up to bid on another toy vehicle with an estimate of £40-60. Oh, dear. The anguish. It's £50 on the net. 55. And again that pesky internet is pushing up the bids. -Go and then, one more. adding the toy car to her collection for £76.70 with costs. which is kind of reflected in the price I paid. But it's because I've got a full-size version of one of these. Well, she had her head turned there but the force is with her. She's spots a Star Wars Yoda figure. about to bid on some movie memorabilia. Sorry, sorry! I like it anyways. The price has gone light speed into the stratosphere. HE BANGS GAVEL Oh, why didn't I get it? Will I regret it in the morning? but Phil is thinking about future sales. as a lap counter on vintage Bentleys. to set up a sale before he even bids on the item! Phil can devote a little time to wind up Kate. I think he wants the next lot. that Phil has a possible buyer for. They've a guide price of £50 to £80. Not great condition, though, are they? Touche! But nothing is putting Phil off! Just look at those subtle bidding nuances from the Fox. It's zoomed past the estimate! ..180, gentleman - 190. 200. Bid. Thank you. 200. 220. GAVEL BANGS Well done, you. So a hammer price of over £160 above the estimate. Foxy seals the deal at a whacking £283.20, including costs. -Shall I let you into a little secret? -and I sent him a picture of them. to the box office to check out the takings. They both started the day with £1,000 of their own money to spend. but spent a massive £829.54. But all that matters now is profit. but how will they review each other's performance? ..18th century misery here, don't you think? -There's a distinct division, isn't there? I would say you're quite cool with your poster, actually. -What about me half a seat? -Maybe not quite so cool. -Are you saying I'm quite cool with this, then? I love your weights. I love your corkscrew. I love your toys. I don't understand your jewellery. And I'll have a large gin. and I think they're pretty funky. But you've got a millionaire who's going to buy those. -I hope he's a multi-millionaire. -Do you know what I like about yours? I like your train tickets. -I think those are quite fun. Well, nothing is certain, but may the best man or woman win. to the blockbusting main feature of the selling! they've got what it takes to be A-listers. Both now head back to their hideouts to find a path to profit. Way over in Worcester, Phil is working his way through his wares. I found the auction really, really tough. that's cost the thick end of £180. and this might form part of their display. and sell that to someone who's got a footballing interest. at £35. My bits of treen were £55. I think quite a good little retail lot there. And this collection of chemist's items, they were £100. those are my winner or my loser. cos if he's not, I am snookered! Old Foxy is guaranteed to have a trick shot or two up his sleeve. Over in her Hereford home, Kate is also looking at her lots. I've had to pay pretty strong money for my pieces. With the exception of my jewellery. I think will take those off my hands very readily, with a decent profit. just some very ordinary postal weights. So the value is in these lovely brass weights that form a set. they're going to be used, perhaps in an old-fashioned setting. who would like to use it. The tragedy has happened with my bull. I unwrapped it and it's got a broken leg. Which somehow happened in transit. Moving onto my glasses, though, these were a really speculative buy. I think it might be the jugs, though, that are my best sellers. They're a little bit more commercial, perhaps. All in all, for these items I've got quite a bit of homework to do. the dinky toy fire engine and the toy land rover. leg work and web work that will help make their profits go stratospheric. and the money is taken. and hits her home turf of Hereford with the amber ring and earrings. She's come to see Anna and Tracy who own a jewellery shop. Well, I know that you specialise in amber in silver. These are a little bit different cos they're in 14 carat gold. It's actually a rose gold. It's got that pinky tinge to it where they mix the gold with copper. with fake amber or plastic. -So that makes it a very interesting piece. I would think they date from probably maybe the '70s, I would say. -I think they wouldn't look out of place here. Definitely not. Well, let's talk price. I think the ring's worth sort of £90-£100. Well, I'm happy with 180. That sounds fair to me. -I think that's a good deal, to be fair. Kate makes a profit of £91.50 for the jewellery. She's making more money than mere pennies. And talking of "Moneypenny", Phil thinks he's spied his first target. owner of a barbershop, will our man, Mr Serrell, have the Midas Touch? -Now, there's two reasons why I've come to see you today. -Your barbershop is absolutely full of memorabilia. -But you haven't got any James Bond memorabilia. but it's got a signature of the great man himself, Sean Connery. -What can you bid me for it? -Can you bid me 250? -Yeah, OK, I'll meet you at 250. Right, now, totally separate deal. -How much is this going to cost? -Oh, here we go. Done here, aren't I? and whilst he's there gets a well-deserved haircut, too. Which he pays for out of his own pocket. Let's not be too drastic here. Oh, doesn't he look smart? Still on his home territory, he's got another sale up his sleeve. in Worcester, and is meeting owner Keith. Remember, he spent £33 on it. Do you remember I mentioned to you railway tickets? But the thing I really love - look at this one here. So, presumably, these would be war time, would they? -Second World War? Now, these came up at auction. thing, cos you're very much transport-related, aren't you? -Yeah, we've got all that. and get...70 quid-ish to the right person? They probably would make 65/70, I would have thought. -But you've got to earn a little crust out of it, haven't you? -Yeah, I'm happy with that, I'm happy with that. Looks like we've both got a bargain. -I hope so! Take care. Cheers now, bye-bye. And Phil collects a profit of £21.96 for the tickets. Full steam ahead for me. hoping to find a home for her Victorian weights. and the perfect setting for my Victorian brass weights. I need to get into character. who works at the museum, hoping to make a profit on the weights. Ah, Paul! Kate! How do you do? -How do you do? Lovely to meet you. -What do you think of the gear? -I think you look rather resplendent. -I went for the posh outfit. Yes, definitely. Definitely. Very elegant. And what a fantastic setting. And everything as it would have been in a 1900 working-class pharmacy. Well, my weights have come to exactly the right place, then. So, we've got some tiny ones. if you like, is this little set of what's known as cupped weights. -"Apoth", A-P-O-T-H, in the bottom, there. Exactly, obviously came out of an apothecary's. Mm-hmm. But what sort of date do you think they are? Well, certainly the set of cupped weights, I would put at about 1880. I'd be very interested in knowing your price for them. I would hope for perhaps £80-£90. if you could get closer to that. does that sound a good mid-way point? -I think that sounds perfect. Thank you very much, indeed. for a profit of £48.64. let's see where we are at this stage in the selling. Phil needs to catch up if he's going to win this leg of the race. hoping to get it fixed and sale-worthy. for his lap counters before he bought them. that he paid for them. -Hello, Philip. Nice to see you. -Lovely to see you. Yeah, yeah, yeah. What it really needs is a pair of lap counters. -Do you remember I phoned you at the auction? And there was a pair of lap counters and, so, these are...it just clicks. -And they work, as well. They were used in period. They were, for example, on a car like this - 1935 Squire. -Have you ever seen any of these for sale? -No, and I have looked. -This is the right place for these. This is absolutely the right place for it. They cost me the thick end of £285. -What are they worth to you? Well, I'll double your money. Uh...thank you. You're a gentleman. shifting this selling half up a gear. -So, this is it. This is lovely. -And where would this go? Phil hops in for a lift, very much hoping to lap his opponent. But Kate is also selling in the fast lane. a £46.90 profit from Andrew, who owns a map shop. selling it to four-by-four enthusiast and collector, James. of £12.80, when she sells it to Hereford based collector, Chris. to Vickie, who runs a vintage coffee bar in Cheltenham. and then these two jugs, which I particularly like. And, as you can see, they've got quite an arty look to them. They actually date from the early 1990s. The factory is called Ritzenhoff. a sort of retro feel about them, and obviously really arty. got such a lovely retro setting, here. It looks fabulous. -I particularly like the cowboy one. used more for events that we do. So, how does around the, sort of, £200 mark sound? Could you go up just a tiny bit for me and say 160? Yes, because of the cowboy. -Brilliant, thank goodness I bought that one. for the glasses, so it's Happy Days. Look at that, that's what these glasses were made for. so he's off to see Dr Peter of Guarlford. He's making a house call with his pharmacy items. than I am. How does that work? Well, this is a Nelson's inhaler. -It's really for chest problems. a couple of menthol crystals in there. -and it cleared the lungs. It's the first line of approach. get stuck into that. Yes. -Is this of any interest to you? -I've got lots of these things, anyway. I would think 50 or 60, I would be happy to pay. Oh, please, or I'm going to lose money! Oh, dear! Remember, Phil paid just over £100 for the lot. -Yes, you might well do. Actually, that's nice. This was for making nightlights. I think, probably, I'd go as far as 70. This is a nice one, actually. Yes. This is getting better. Have another look. Just try and make it a bit better, please! Yes, OK, I'll give you 100. I'm going to shake his hand quickly. and the poor old thing needs to have a lie down. to Worcester-based antiques dealer, Alyson. Now, the bull is back. and is ready to re-enter the ring. Well, I'm in my element, in my wellies on a Herefordshire farm! And I've come to meet a Hereford cattle breeder. that's pretty cheap to keep. So, what did you think of this fella? Does he live up to the mark? -..and he hasn't got a ring in his nose. you can't take him out on the road. -..that Beswick, the porcelain factory, have got here. Now, this chap dates probably from the latter part of the 20th century. -And he's in lovely form, as you can see. -just to one leg, here, which has been professionally done. -He would look nice in my house, yes. -He would look nice, yes. I'm looking for roughly between £150 and 200. -he wouldn't be worth 200. -Well, that sounds great to me. Kate makes £44.20 on the bull and she's delighted. with the perfect Herefordshire herd. And, so with that, Kate is all sold up. Phil, however, still has one item left. It's the Wembley seat-back signed by Sir Geoff Hurst. because I'm here to watch Worcester City play football. I just hope this doesn't end up as an own goal. at the grounds they're sharing with Kidderminster FC. -I've got a bit of history for you, today. ..signed by Sir Geoff Hurst. -what will you do with it? -I shall purchase it for the club. stadium that we are hoping to build in Worcester. -and get a lot of money out of you for this! -I will give you 300. You're a star. Thank you very much, indeed. Yes, and it's all over for this beautiful game, too. let's see how much our opponents spent, today. with £1,000 of their own money. Six in total, but spent more. But all that matters now is the bottom line. challenge will go to the charities of their choice. -How did you get on? -Well, I really, really enjoyed it. Oh, new scarf? Good colour. and sold the chairman my Geoff Hurst seat. Do you remember that? -And what about you? How did you get on? Well, I went back in time to sell my weights. -You had those cool glasses, I loved those. -The cool glasses went well. -That's what you want to hear, isn't it? -I did love those, actually. And what about those brass markers you stole from me at the auction? Stole them - that sort of money?! to a guy who really, really wanted them. wedge of profit in that, as well. -OK, one, two, three, go! -That's a chump, isn't it? Very good. Crikey, was that all the markers? I knew I should have bought 'em! lapped his opponent and proved he's a cut above the rest. Well, congratulations to Philip. I take my hat off to him. He bought well and sold even better. and I can't help but think it's all down to those billiard markers. It's lovely to sell something to someone who really, really wants it. at a car-boot sale in West Sussex. 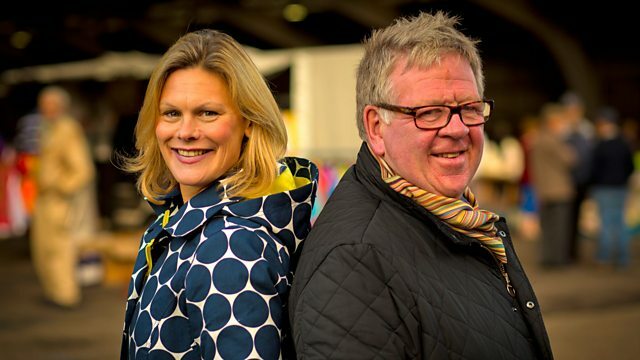 Old friends Phil Serrell and Kate Bliss venture to the other side of the rostrum at an auction in Gloucestershire, but there's nothing friendly about this competition. Phil does his best to bid up Kate, but will his strategy backfire when he tries to get in on the action?